All our coatings are a one-part, spray-on product to address all three types of heat transfer- Conduction, Convection and Radiation. The coatings reflect 97% of solar radiation, lower the temperature of hot machinery, insulate against ambient temperatures, eliminate condensation and dampen sound. 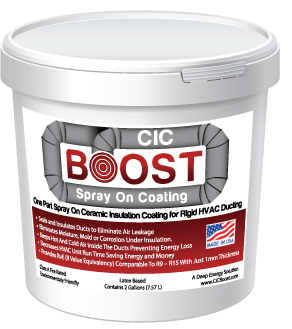 CIC Boost helps achieve anywhere from 2 - 14 points on the LEED rating systems. This product can be used for access to a variety of LEED Version 4.0 points under the following Rating System and Categories: BD+C and O+M; specifically Energy and Atmosphere, Materials & Resources, and Indoor Environmental Quality. Please contact us for more information. 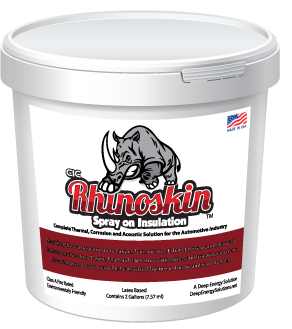 All of our Ceramic Insulation Coating products: CIC Boost, CIC Heatblock and CIC Rhinoskin are made of the same advanced formula ACS CIC 4.0 and use the same principles to target different markets. Here are how they work. All our Ceramic Insulation Coatings (CIC) are essentially a high-quality latex paint that’s highly saturated (80%-85%) with tiny ceramic particles. 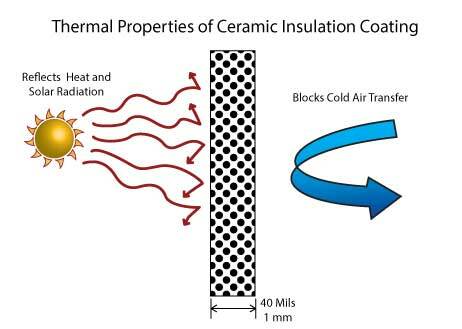 It works initially by reflecting a very high percentage of solar radiation and then on the principle of blocking radiant heat transfer in the same way as thin oxide coatings on Low-E windows blocks infrared radiation’s penetration through windows. CIC relies on the tightly bound ceramic particles and very thin air gaps in each application layer to dramatically slow conductive heat transfer. CIC is usually applied in thin successive layers interspersed with air gaps to total thickness of about 1mm (0.04”). CIC works differently than traditional insulation blankets or foam that rely predominantly on blocking conductivity or slowing of heat transfer by forcing heat to pass through soft mass. Conductivity is measured by a material’s thermal resistance or “R Value” based on it's thickness. CIC doesn't have this mass but provides a R-Value Equivalency (RvE) of R9 - R15. CIC effectiveness is based on resisting all three types of heat transfer – radiation (Heat you feel from a heat source such as the sun, fire or furnace, primarily infra-red type), conduction (Transfer of heat through direct contact through the roof, walls, windows or other material. Heat conducts from the hot side toward the cold side. ), and convection (hot or cold air movement across surfaces). This allows CIC to be effective despite lack of mass by using layers of concentrated ceramic particles interspersed with thin air layers. Its greatest resistance is to radiant heat transfer, particularly infrared-based solar heat radiation that can warm surfaces far above ambient temperature. Radiant barrier performance is complemented by conductive insulation value and resistance to convection for very effective insulation performance. CIC conductive properties are especially valuable for warming cold surfaces and preventing condensation. High resistance to air circulation’s convection cooling effect, also contributes to efficiency by keeping surfaces warmer. Its ability to control condensation makes it very useful for HVAC equipment and ducting. CIC reflects and blocks heat transfer. A thermal bridge, also called a cold bridge or heat bridge, is an area of a building which has a significantly higher heat transfer than the surrounding materials resulting in an overall reduction in thermal insulation of the object or building. Traditional insulation is installed between the studs, the studs themselves conduct heat and a building with metal studs increases the problem. 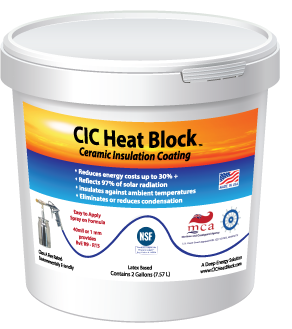 CIC blocks thermal bridging by providing continuous membrane to distribute the heat evenly eliminating hot and cold areas on framing. CIC can be used as standalone insulation on building envelopes or, perhaps ideally, in conjunction with mass-based, conventional insulation. Conventional insulation works by creating a barrier that slows heat transfer through roofs and walls. But once conventional insulation becomes saturated with heat energy, it releases that heat into the building. Conventional mass-based insulation is very useful during the winter for the purpose of holding in heat and maintaining a warm envelope of heat around your home’s walls, ceiling, and floors. However, during a warm summer, the mass becomes a heat sink, absorbing energy during the day and slowly releasing through the night. CIC Heat Block, on the other hand, works by initially reflecting a very high percentage of solar gain away from the building! It also slows the transfer of the remaining energy with low-emissivity and low-transmittance properties. Deep Energy Solutions is actively seeking to achieve much larger energy savings than conventional energy retrofits. We specialize in three specific areas: Building Envelope, HVAC ducting and the Transportation Industry to bring a revolutionary ceramic insulation coating to each of these markets.